For those on Flickr, you’ve probably seen this already. For some reason, I couldn’t bring myself to blog about it until now. As quickly as one dog came into our lives, the other was lost. Our dear sweet Shambles died last Wednesday at the ripe old age of 17. He was such a funny old man and to say we adored him doesn’t begin to cut it. We were devastated by the loss but are feeling much better this week. Many thanks to everyone who made comments on Flickr or will here. I know a lot of people grew quite fond of the cranky old goat, and who can blame them? He was one of a kind. I’m behind on the fiber club, between Shambles sadness and Christmas orders. If I don’t get it out before Christmas, I’ll have it finished and boxed before Christmas and mail it straight after. I apologise for the lateness and hope everyone understands. Thank you! I put some Maisy Day Handspun yarn in the shop today. Yay! I am deeply sorry for your loss. I have two young pups myself and know what a joy that dogs bring into our lives. I am so sorry for your loss and hope you find peace during this difficult time. Oh, I’m so sorry. That makes me sad; it must just be devastating for you. My heart hurts when I hear about people losing their pets. I’m so sorry. My animals are the world to me; I can imagine how hard it is. I never had the pleasure of meeting Shambles, but I felt like I did after hearing your great stories about him. He led a very good life thanks to you and your husband. I send you hugs. I’m so sorry that you’ve loss Shambles — he sounded like such a great old fellow. I’ve lost two of my dogs this year, so I know this is a difficult time for you. I’m always amazed at how such a little critter can have such an enormous personality and give so much love and joy. [ Take care, my friend. i am sorry for you. i know how sad my friends get when their dogs die. not that it happens so often but it does sometimes. and he looks like a great dog. Sorry about your loss . I lost my Shih tzu Max last year after 14 years and it takes time….. I am sooooo sorry. I know how our little dogs can be such personalities – it is the loss of a dear friend. I tell my little dog that he must live forever. I am sooo sorry for your loss. I’m so sorry. You’re in my thoughts. Adrian, my condolences on your loss. I know you’ll miss Shambles greatly. I’ll miss seeing your photos of him! Take care of yourself. The loss of a beloved pet is devastating. I’m so sorry. Oh sweetie. I am so, so sorry. Hugs. Oh no, I’m so sorry. I wish there were something to say to make you feel better, but I know there isn’t. But I offer you cyber hugs. So sorry to hear about Shambles’ passing. I’ll keep you in my thoughts. Just from reading your blog, it was so clear how much you both loved him. He was a lucky little puppy. I’m so sorry for your loss, Adrian. We lost our Border Collie the day before Thanksgiving. They become such important parts of our lives, it’s hard to be without them. Shambles was a lucky guy to have such a great family. I’m so sorry. It really is devastating to lose a pet. I just lost my bunny last week. Shambles was lucky to have you as his mom. Oh how sad! No hurries on the fiber club – I can wait, all things considered. Such a loss! oh no! I’m so sorry for your loss. I’m glad you’re feeling a little better. it must be nice to at least know he had an amazing, long life with you guys. I’m very sorry for your loss. It’s never an easy thing. I’m so sorry – these wonderful little animals come in and out of our lives so quickly but they give us a lifetime of love and memories. Take care. Oh Adrian, I am so sorry. I got so used to seeing that little guy on your blog–he was such a personality! Take care and enjoy the memories–hold them close and and Shambles will always be nearby. Don’t forget to enjoy your new pup too! My deepest condolences. I know how hard it is to lose a beloved pet. Oh Adrian, so very sad. ~BIG HUG~ I too have had the appearance of one precede the disappearance of another. It’s quite uncanny how that all goes down… I really am so very sorry at the lose of your grumpy ol’ boot. I’m so sorry for your loss. We lost our dear little toy fox terrier Nellie, who was 16, right before T-Day. It’s still pretty darn tough. Your dogs are awesome looking! I’m taken with the wire haired variety. I am so sorry to hear of your loss. I wish I could make it all better for you! Poor old boy. So sorry for you. So sorry about the loss of Shambles. We never have them long enough. I’m so terribly sorry for your loss. For whatever it’s worth, you and your husband are in my thoughts. So sorry about the pup, Adrian! Sending you lots of warm hugs and thinking about you. Oh, boo! I’m so sorry to hear about Shambles, the best named dog ever. i’m so sorry for your loss. i loved seeing photos of him and i look forward to seeing more of pippa. i hope she’s comforting you during this time. I’m so sorry! I’ve never lost a dog–only little fuzzies–and can’t imagine how hard it would be. I’m so sorry for your loss. It sounds like he had a wonderful life with you though and hopefully those good memories will carry you through! Oh no. Big hugs. Losing a member of the family is always so hard. So very sorry for all of you. Oh Shambles. I may have never commented on how much I enjoyed seeing your adorable face on this blog, but it brightened my day every time. sorry to hear about your man. The passing of a pet is never easy. Good luck healing. I’m so sorry about your loss. It’s crushing, no matter the age. But he was lucky to have you guys. Take care and I think we all understand about any shipping delays. Oh, Adrian. I’m so sorry. I know how hard it is losing a beloved fur baby. I’m so sorry. I always looked forward to seeing pictures of his sweet little face. Adrian – I am so sorry. My heart hurts for you. He must have been a very loved and well cared puppy to have lived 17 years and I am sure he continuous to love his mom and dad from dog heaven. I’m sorry. He is adorable and it’s always hard to lose our pets even if we know they won’t outlive us. so sorry to hear about sweet shambles :( hugs! I am so sorry for your loss, nothing is harder than losing a family member. He will be greatly missed by all. I’m sorry for your loss. It’s hard losing a pet after such a long life, and so close to the holiday season it’s even more difficult. 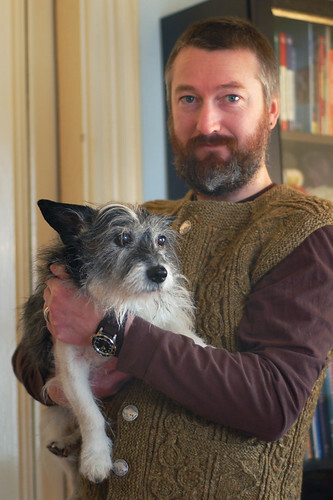 I’m an American knitter living in Japan, and my family dog died after a good 14 year run. I was racked with guilt for not being there during the last week when her health deteriorated so rapidly. There’s no replacing them. Oh- I’m so sorry for you. so sad for you. it’s hard for other people to understand how a pet means so much… you know them like you know family and in many ways they are. so sorry about the doggie! I’m so sorry to hear about your loss. Shambles looks so happy in the pictures you post and I’m sure that he was very, very happy with you. I’m also sure that Pippa is doing her best to provide you with enough dogginess in your life. My heart goes out to you. I’m glad that you have Pippa to comfort you, but it is never easy. Hugs and much love to you. How truly sad. It’s heartbreaking to lose a good friend. I’m sorry for your loss. I’m so sorry to hear this news. What a cute, sweet, funny little dog he was. You were lucky to have each other! I know the pain of losing a beloved pet, and my heart goes out to you in your moment of grief and loss. I’m glad to know Shambles had a full, happy life and was dearly loved by your family. No doubt, wherever he is, he’s thankful for that. I’m so sorry to hear of your loss – it sounds like he had a full, and wonderful life – but I know that that doesn’t ease the sadness. I’m so sorry, Adrian. What a fantastic little creature he was. I’m not a small-dog person at all, but he was always so cute and charming that he convinced me to give the little dogs of the world a chance. I’m sorry you’ve lost your friend. They take a little piece of our hearts with them when they go – but they give so much while they’re here. I’m so sorry about Shambles.Its so hard to lose a furry companion. Oh my, I am so sad to hear about Shambles! I will miss seeing pictures of him cuddled up on his special spot on your couch. I am sending you huge hugs- I am so sorry. I am so sorry to read about Shambles. Thinking of you from across the pond. i know everyone’s financial situation isnt the best right now, but what made me feel better was donating money to a rescue group in honor of the pet i lost. your dog’s spirit will live on. Adrian, I’m so sorry. I spent so little time with dogs in the past 10 years of my life, that I remember the time I met you and Shambles so well! He was a great dog, and I always enjoyed your updates and photos of him. Thanks for sharing his life with us, my sympathies. I’m so, so sorry. It’s hard to lose our beloved pets. I’m dealing with all of that right now, with my fifteen year old Golden Retriever. It’s hard. So sorry to hear about Shambles. He had a very good life with you guys. Your new dog is adorable and will hopefully help you heal! We miss you guys in Boston. Drop a line sometime! Best regards, Susan and John (Zephyr and Zelda)! I just read about Shambles – I’m so sorry. I came across Shambles through a Google search last year looking for Jack Russel/Cairn mixes. We couldn’t believe how much our new pup resembled Shambles (and does even more now that she’s full grown!). I got a kick out of his pictures and your captions about him.